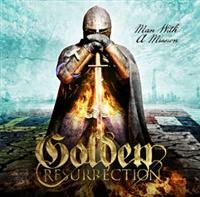 GOLDEN RESURRECTION returns with their second outing, the first being their debut “Glory to My King”. Eager to capture on the success and time in the spotlight for guitarist Tommy ReinXeed (REINXEED) and his joint venture with Christian Liljegren SWEDISH HITZ GOES METAL wasted no time after Tommy´s appearance on Swedish prime time TV. The rest of the band are Stephen K, bass, Rikard Gustafsson, drums and Kenneth Lillqvist, keyboards. This time we get ten tracks, the digital release an additional two, both tributes to KANSAS and GARY MOORE respectively. The intro “The Light Overture” is not really a firm statement on anything, no time for that in a little over a minute. The title track on the other hand boosts some hysteric keys and a good refrain. The good times on the album opens with “Identity in Christ” and “Golden Times”. The neo is there, as always, but also touches of AOR, and probably the ABBA that both Tommy and Christian love. The unashamed fab melody returns in “Are You Ready for the Power”, a hey-hey track which is a flirt with the next round of the Eurovision Song Contest really. The album has a light and airy production but the lack of bass is tangible, a bit surprising since they seem very fond of their bass man. The tributes are quite flamboyant, especially the GARY MOORE track which has always been a monster track. The rest of the album is quite ok, expect unashamed guitar worship, as well as a gross exploitation of the neo-classical genre. They do it in fine fashion, albeit with some flaws.